Caught up with Day 2 and Day 3? As our time in Amsterdam draws to a close, all that there’s left to do is get on the train to our next destination, Berlin. 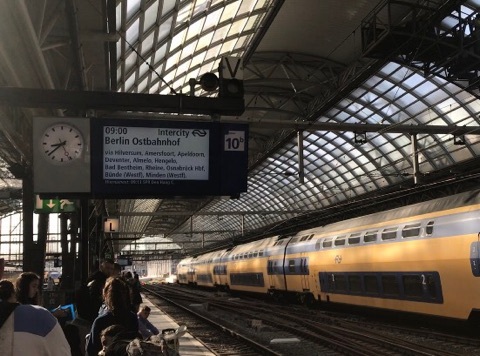 As we took a plane to Amsterdam, this would be our first European train journey with Interrail. Therefore we thought we’d share the experience with you, and answer the questions we had in our own heads before today’s trip. When you buy an Interrail pass, you can get on any train in all but a couple of European countries. However, on top of this you can buy reservations which will guarantee you a seat for the whole of your journey. As a lot of the trains can become very busy, especially in the summer seasons, this is definitely advisable on some routes. 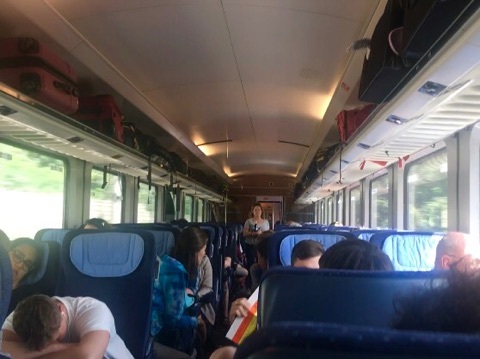 A couple of days ago, we did buy a reservation for our train to Berlin, but as it only cost us about £20 for both of us, we weren’t too upset about it. But we got ready and headed to the train station as soon as possible and get a spot on the platform for the next train at 9am. It was half an hour until the train was due to leave and the platform was already packed, probably full of people who like us, now didn’t have a reservation. We waited for the train to arrive, and everyone scrambled to find a seat which wasn’t reserved. Oddly enough they didn’t assign all the reserved and unreserved seats separately, so it was just a case of checking the electronic board above each seat to see if it was taken. 9am came and no one had taken these two seats, and with the alley ways of the train still packed with people and with nowhere else to go, we took a gamble and sat down. All was well until half an hour later someone finally made it to their seat. It was pretty annoying but also inevitable. The hunt began for new seats and pretty luckily we did find some. We do now think of a plan going forward if we continue to go without reservations, or pay extra and avoid the drama. Plenty of people were sat on the floors in between carriages and we do not fancy that one bit! Anyway, the journey was 6 and a half hours long, and in the end it was very comfortable. Even Jessica who normally finds long journeys tough did very well, and wasn’t too annoying! 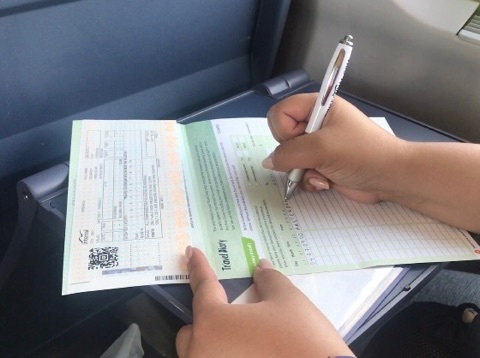 With the journey behind us and now in Berlin, our first job was to collect our Berlin Welcome Cards* from the tourism office at the station. This will give us free access to the public transport and discount to a number of attractions. We’ve already planned to visit a few in the next couple of days whilst we’re here, so keep checking back on the blog to see exactly what the card can offer. With most of the day spent on the train, we spent the evening relaxing at a superb Asian restaurant, which you can read about on our food blog. The real Berlin adventures begin tomorrow! Disclaimer: we were given complimentary Berlin Welcome Card’s (*) in exchange for a mention in this blog post and coverage on social media. However as always, all pictures and views are our own. You must have been so excited for your first interrail journey, can't believe you both slept through though haha! One thing I'm not sure about with Interrailing is the trains, but this doesn't sound too bad. It's kind of given me a bit of confidence that I won't die, hahaha! And 6.5 hours isn't bad either – I had to do 4.5 hours of trains just to get from my home town to uni! Hope you have the best time in Berlin!